Lebanon looked at the Syrian border with disgust this week, as the jihadi militants who once overran the town of Arsal in August executed one of the Lebanese soldiers that were taken hostage. Since the civil war began in Syria, Lebanon was amazed how a simple conflict can so quickly turn into a sectarian one, forgetting that one of the most brutal sectarian wars had happened on the streets of Beirut 40 years ago. Lebanon was amazed how easy calls for partition can be well received, forgetting that in 1975, one of Lebanon’s founding fathers ironically called for separatism. 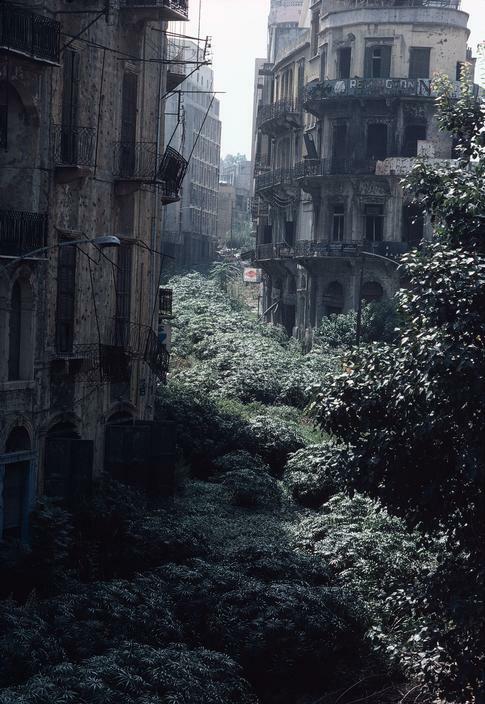 Lebanon was amazed how quickly a sectarian state within a state could emerge from the rubble of war and how organized it could become, forgetting for a while here about moments like this one in the Lebanese civil war. Lebanon was amazed when the Syrian militants started taking foreign journalists, photographers and aid workers as hostages, forgetting for a while here about our numerous hostage crises in the 1980s. Lebanon was also amazed when the Syrians militants mistreated those hostages and started the executions of James Foley and Steven Sotloff, forgetting for a while here about names such as Michel Seurat and Arkady Katkov. Lebanon was amazed how both sides of the conflict looted multiple heritage sites and souks in Syria, forgetting for a while here how the Lebanese militias’ first most admirable achievement (and yes, that’s sarcastic) was the looting and destruction of hundreds of years of rich history in Beirut. Yes, there were days when Lebanon had actual, historic Souks, you know. Lebanon was amazed how both sides of the conflict were destroying Syria’s infrastructure. And yet the very first thing a Lebanese will tell you about the Lebanese civil war is some battle involving hotels. Each side will tell you how heroic that battle was, and everyone will skip the part where the Hotel district, the symbol of Lebanon’s once touristic era, was reduced to rubble. Lebanon was amazed how both the Syrian sides of the conflict are waging a war of attrition and besieging cities and starving their cities to death. As if Zahle wasn’t besieged. As if Beirut wasn’t besieged. Lebanon was amazed how foreign fighters and Europeans and Lebanese have now active roles on the battlefield in Syria. As if the Syrians never entered Lebanon in 1976, or the Israelis in 1978, or the Americans and Italians and French in 1982. As if the Palestinians never carried weapons, and as if the Lebanese never hired non-Lebanese mercenaries. Lebanon was amazed how Syrian members of the same “coalition” or sect could turn on each other’s back in their quest to power. As if the war of the camps never happened. As if the Aoun-Geagea wars never happened. As if the Amal-Hezbollah infighting never happened. But here, lies the most disgusting of all ironies. Lebanon was amazed how Syrians could kill each other and commit massacres for the simple reason of belonging to a certain tribe or religious group. As if Lebanon wasn’t the country that innovated the concept of killing based on the citizen’s sect (ذبح عالهوية). As if the black Saturday hadn’t happened. As if one of the biggest massacres (Sabra and Chatila) that had ever happened since the Nazi era, was never committed in Beirut. As if Karantina and Damour never happened. As if 1975 hadn’t happened. As if 1976 hadn’t happened. As if 1977 hadn’t happened. As if 1978 hadn’t happened. As if 1979 hadn’t happened. As if 1980 hadn’t happened. As if 1981 hadn’t happened. As if 1982 hadn’t happened. As if 1983 hadn’t happened. As if 1984 hadn’t happened. As if 1985 hadn’t happened. As if 1986 hadn’t happened. As if 1987 hadn’t happened. As if 1988 hadn’t happened. As if 1989 hadn’t happened. As if 1990 hadn’t happened. As if 1975 hadn’t happened. Why are you amazed, Lebanon? How can you be amazed , Lebanon? How can you be amazed, and not be a hypocrite? There is no generation gap here. A big number of the Lebanese politicians/citizens that once fought the civil war in their twenties are the same ones, now in their forties, or fifties, or sixties, criticizing the brutality of the Syrian Civil War. There is no possible way to describe the hypocrisy of the Lebanese. If you want to blame anyone, do not blame the terrorists or the tyranny. Do not blame the terrorists or the tyranny. Do not blame the terrorists or the tyranny. Blame the terrorists or the tyranny you inspired. Most Lebanese, directly blame Iran, the United States, Saudi Arabia, Turkey or Russia for everything that’s happening in Syria. It doesn’t matter. The inspiration, the ideas, they come from the 1980’s. They come from Beirut. Perhaps Gold, diamonds, and Jewellery aren’t Lebanon’s top exports. Perhaps after all, sectarian brutal civil wars are Lebanon’s top export. Here’s a small message to the neighbors next door: You know those people who are destroying your country? There will come a day when they will all rule you, via a consensual dictatorship, and tell you that you’re in a beautiful democratic republic. And – for a reason no one could ever understand – you’ll be happy about it, and amazed at the brutality of another civil war next door. Ramez, I finally decided to write a comment! I have been wanting to do that for a year now. Your articles are the most fascinating to read among all the ones I have followed on Lebanon. I enjoy your research, external links, vintage photos, and most importantly, your insight. Although born in Jezzine in 1966, I grew up in the US and lived the Lebanese War as a youngster through the television news (as a translator for my dad! ), newspapers, shortwave radio, and anyone who lived/visited Lebanon and came back to share their observations. Finally, I returned to my homeland for the first time in 2009; a complete emotional wreck for my entire 3 week visit! My only disappointment in your blog — is its infrequent update! I am most certain you are incredibly busy but I just wanted you to know that you do have readers who tremendously value your work and encourage you to persist in this endeavor!